The Simulation Based Engineering Lab had the distinct honor of hosting Christian Duriez this week including putting on a public talk about his work. Duriez’s talk discussed the numerical methods for modeling, simulation and control of deformable robots. 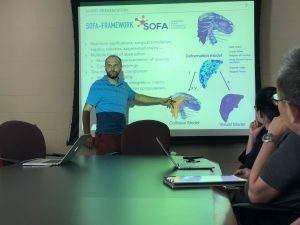 The talk was an overall discussion about the goals and the challenges that his team, DEFROST, faces when making simulations for deformable objects. Most of these challenges are in the realm of physics, mainly contact and friction with deformable and rigid robots. The goals that his team share are real-time modeling of soft robots based on finite element models, modeling contact and interactions with the environment that the robot is in and model-base control of soft robots. Duriez received his PhD in robotics from the University of Evry, France. Since then he has worked at INRIA, the French Institute for Research in Computer Science and Automation, working on interactive simulations of deformable objects and haptic rendering under many different teams. In 2009 his first team was the Simulation in Healthcare using Computer Research Advances (SHACRA) team where he was a vice-head and focused on medical simulation. Currently, Duriez is the head of the DEFROST team where he does his work. The team focuses on deformable soft robotic simulation models.